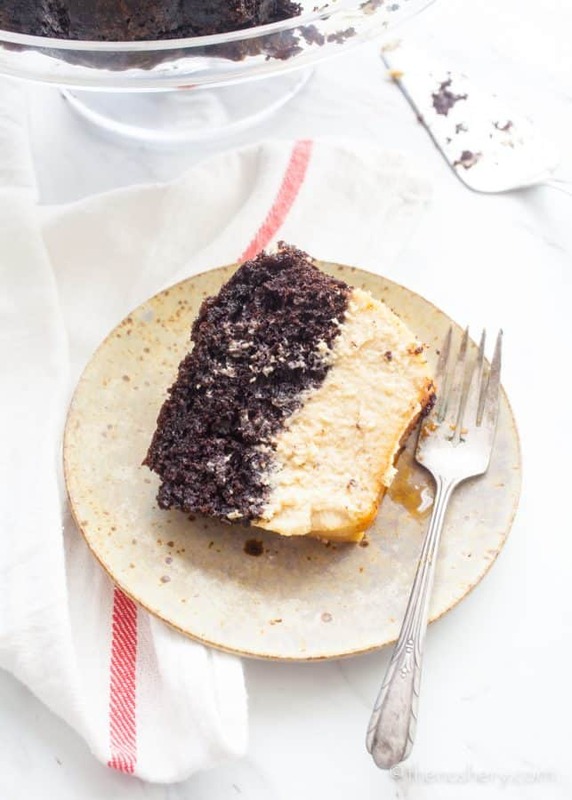 Chocolate and Coffee Flancocho | If you are looking at this dessert and thinking “that is magic cake” or “that is chocoflan,” well we are all right. Honestly, it doesn’t matter what you call it it’s the most amazing dessert ever. Especially if you are an indecisive person or love dessert. 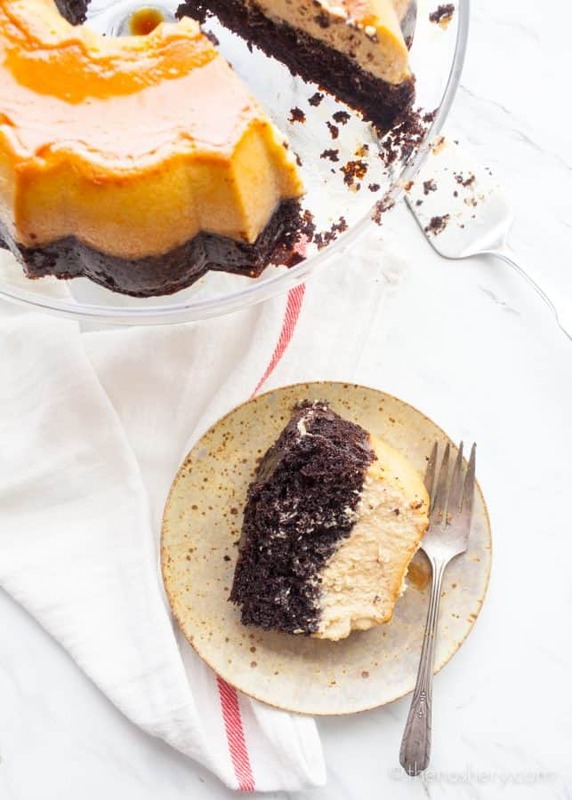 Because you never have to choose between cake and flan again! Picture this, someone comes up to you and asks, “Would you like cake or flan?”. How are you suppose to choose? Well, you don’t have to! I present to you flancocho! It’s cake and flan all in one dessert. It’s a thing of beauty and magic. 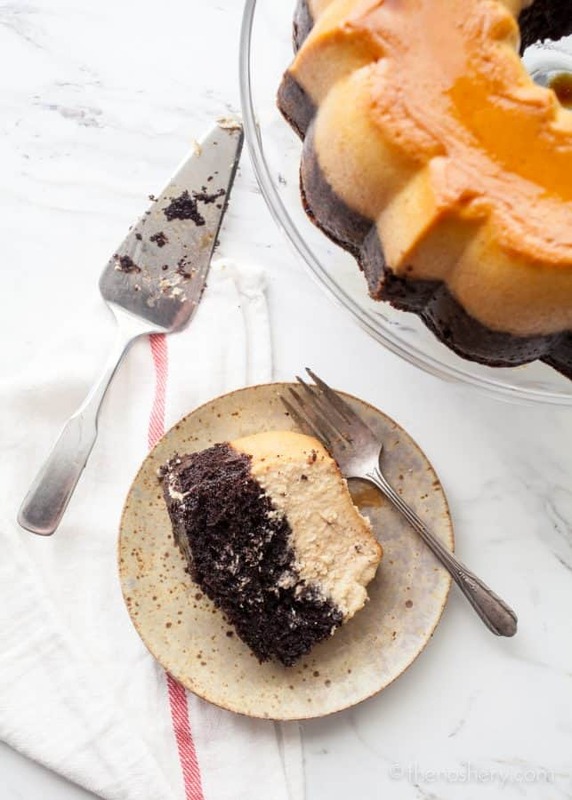 The name is a combination of flan, the caramel custard layer, and “bizcocho”, the cake layer. If you are wondering how can this be? It’s basically magic. No, I did not bake a flan and a cake and layer them on top of each other? 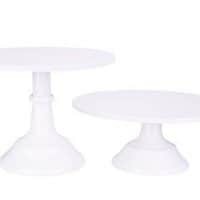 The bottom layer is a simple box cake and the top layer is a classic cheese flan. First, you pour the caramel into the pan, followed by the flan batter and over that I poured the cake batter. Without mixing the batters I baked it in the oven and they magically separate and become two separate layers. Hence, why it’s also called magic cake. It’s pretty awesome! I did not grow up eating flancocho. But recently my mother had tried it and insisted that I give it a go. When she explained that it was a cake and flan in one I was 100% on board! Flancocho is traditionally vanilla flan with a vanilla cake but I wanted to make something more fun and not so vanilla. (Hehehehe) I decided to go with a coffee flan and a dark chocolate fudge box cake. Yes, it’s as awesome as it sounds! Coffee and chocolate are a perfect pair. If you aren’t a fan of chocolate your crazy but it’s ok we can still be friends. You can use any box cake flavor like carrot cake, lemon cake, or coconut cake. All of which I think would be a great combination with this flan. When melting sugar to make caramel do not leave it unsupervised. The moment you do it will burn. 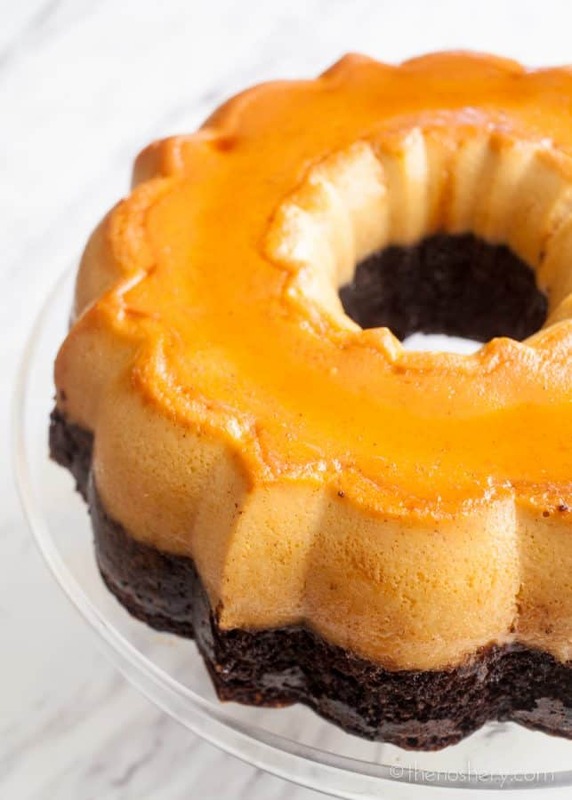 Use room temperature ingredients when preparing the flan mixture this will result and a smoother texture and keep the cream cheese from clumping. There is no need to bake the flan and cake separately or par cook anything. simply pour the flan batter and the cake batter over it. The two will separate as the flancocho bakes. Allow the flancocho to cool completely before inverting on plate. Flancocho can be made a day ahead. You can keep it in the pan & refrigerate until ready to serve. Never choose flan or cake, choose flancocho! In a single bite you get creamy custard and tender cake. How amazing is that? It’s a great cake for holidays, birthdays, and to take to a party because it’s a great conversation starter. People are fascinated by how the layers are created. Also, it’s freaking delicious! Flancocho for the win! If you are looking for more Puerto Rican treats try tembleque (coconut pudding), barriguitas de vieja (pumpkin fritters), or flan de queso (cheese flan). But you have been warned all of these are incredibly addictive. Are you in search of even more Puerto Rican flavors? Visit my entire collection of Puerto Rican recipes. Never choose between cake and flan again! Instead, enjoy a slice of flancocho. 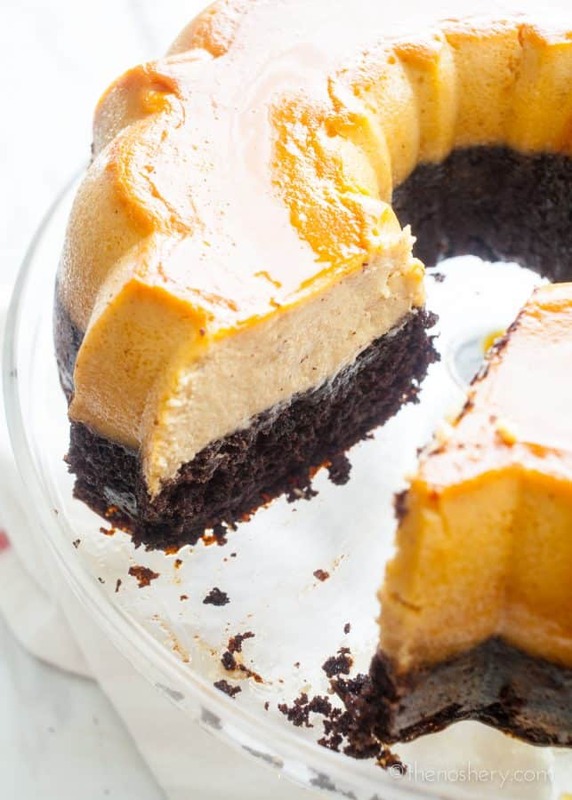 It is a layer of cake on the bottom, flan on the top and it's covered in caramel. Grease bundt pan with butter set aside. Heat sugar in a small saucepan over medium-high heat. Let sugar sit for about 2 minutes until sugar begins to melt. Be sure to keep an eye on the sugar. Once the sugar begins to melt, begin to swirl the pan to help melt the sugar. Continue to swirl until sugar melts smooth, if needed stir gently with a wooden spoon. Be careful not to over brown the sugar. Immediately pour caramel into the bundt pan, evenly coating the bottom of the pan. You will have to move quickly before the caramel sets. Set pan aside until ready to use. Changing to a paddle attachment, beat in eggs one at a time. You want to change to a paddle attachment so as not to incorporate air into the batter. Mix in evaporated milk, sweetened condensed milk, vanilla, cinnamon, and coffee. If there are any cheese lumps floating in the strain it through a fine-mesh strainer. Pour batter into prepared bundt pan, set aside. In a separate bowl prepare cake mix according to directions. Pour cake batter evenly throughout the pan. DO NOT MIX. 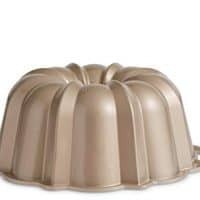 Place bundt pan into a large roasting pan in the oven and pour water into the roasting pan outside of the cake pan until the water covers the flan halfway. Bake for 1 hr or until a toothpick inserted in the center of the cake comes out clean. Let flan cool on the counter for 15 minutes then refrigerate until completely cooled, about 4-5 hour or overnight. Carefully invert onto a large rimmed platter. Where did you get your pan? It’s beautiful! Thank you for sharing this recipe! Okay, so I tried making this the other night and was kind of skeptical that the flancocho would truly separate. This cake/flan is really magical. The flancocho came out fabulous. My husband commented that it was way better than desserts from any restaurant. By the way, the flancocho is also magical in how quickly it disappears. Love all your recipes, but felt compelled to comment on this one. Thanks for sharing. I made this last year and it was HEAVEN… so guess what is in the oven!?! ? After you add the 2 tbs of evaporated milk with the cream cheese in the beginning, you add the whole can at the end when you said “add the milks” right? Can i just leave the instant out or do i need to add something in its place?????? You can leave it out. It’s just flavoring. Could I make the flan a fruit flavor? If so, how? Could I put fruit pieces in the flan batter…or am I going to far from a traditional flan? I have never tried making it this way. I would suspect that adding fresh fruit would add liquid and affect the texture of the flan. If you want to add fruit I would recommend dry. I have made flan with an added cup of pineapple juice and/or coconut cream (sometimes both together) and it turns out fine, no extra eggs needed. No fruit chunks, though, because I love the smooth creaminess of flan, so I don’t know how that would turn out. Can I use a home made cake recipe? Do I have to put the cinnamon? The eggs are for the flan, the cake is prepared according to the package directions. So if it calls for 1 or 2 eggs you will need additional eggs. You only need to pour the cake batter over the flan mixture and DO NOT STIR. As the dessert bakes, they will separate on there own. I bought all the ingredients today, planning on making this for new Year eve. Hope look as nice as yours!? Omg this is my second time making my family loves it, thank you for the recipe. I made two for Christmas they went fast now I have one in the oven for me lol it’s great? I can’t wait to try this!!! All of my “favorite things” rolled into one! I like to give it a gentle shake to loosen it up and then let it cool for at least 30 minutes in the pan. Do I have to use instant coffee? Can i just use brewed coffee? The instant coffee is stronger than using regular coffee. You can also use coffee extract. Do U have to use coffee? And can I use any flavor cake? You can so vanilla instead and do a vanilla cake.